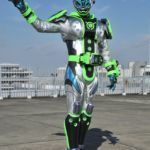 No, it’s not an April Fools Day joke, but rather the revelation of the fourth Future Kamen Rider that will be making an appearance soon on Kamen Rider Zi-O: Kamen Rider Ginga! We first heard about Kamen Rider Ginga through the last round of catalog scans. 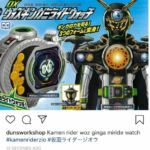 In them, it was revealed that Kamen Rider Woz will receive a power-up called Kamen Rider Woz Ginga, and this is our first look at the Rider proper. In addition, P-Bandai recently updated the DX Mirai Driver pre-order page: all Mirai Drivers will now include a plate and noises for Kamen Rider Ginga’s belt! At the moment, Kamen Rider Ginga’s story, powers, as well as the man behind the suit, remain a mystery. But stay tuned and we’ll be sure to update you as we know more in the future. 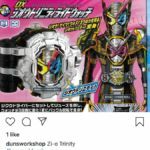 Kamen Rider Zi-O April Scans Released- Introducing Zi-O Trinity! 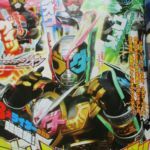 A new round of magazine scans has provided some details on the upcoming adventures of Kamen Rider Zi-O! 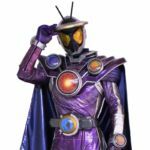 *The traveling treasure hunter, Kamen Rider DiEnd returns! Once again DiEnd is out to gather the rarest items in the world- which in this case means the RideWatches! *Legendary Riders Kamen Rider Blade & Kamen Rider Chalice return, hoping to finally resolve their conflict for good. *To stand against the growing power of their enemies, a truce must be made between the 3 Time Riders- Kamen Rider Zi-O, Kamen Rider Geiz & Kamen Rider Woz. When their hearts and minds are one, a new hero is born: Kamen Rider Zi-O Trinity! This new Rider Fusion has access to all the weapons & abilities of our heroes. *Finally, one more Another Rider has been confirmed and this one is very familiar: Another Agito is reborn! To stop this threat, Kamen Rider Agito returns to battle, alongside a squadron of Kamen Rider G3 Police Riders. It wasn’t that long ago that Bandai unveiled S.H.Figuarts Kamen Rider Woz in all of his glory, and that he’d be released at mass retail. 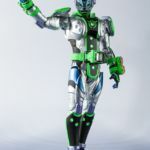 It hasn’t even been a day yet, and already Bandai’s Tamashii pick up page was updated with new photos of this future Rider. 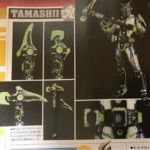 Woz’s signature Zikan Despear weapon will be included, in the Figureoh scan, it showed that it will include parts to create its other modes. It doesn’t appear that his Ride Watches are detailed, a trend which sadly started with Zi-O and Geiz and themselves. 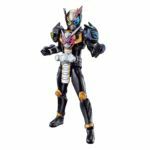 None of the less, S.H.Figuarts Kamen Rider Woz will be released July 2019 for 5940 yen. It’s that time of the month and Figure Oh scans are making their way out into the wild. This month, thanks to twitter user @Tesuka_ we have our very first look at S.H. Figuarts Kamen Rider Woz! In a rather surprising turn of events it would appear that Kamen Rider Woz is a retail release. This means that all 3 main riders from Zi-O will be non-exclusive releases. This stands in contrast to last season, as Kamen Rider Build himself was a retail release while Cross-Z, Grease, and Rogue all wound up as exclusives. So Zi-O is taking a play out of Ex-Aids book by making the primary 3 retail releases at least. Woz is headed to collectors in July 2019 for 5940 yen. Keep an eye out for a full set of official images as well as pre-orders in the near future.